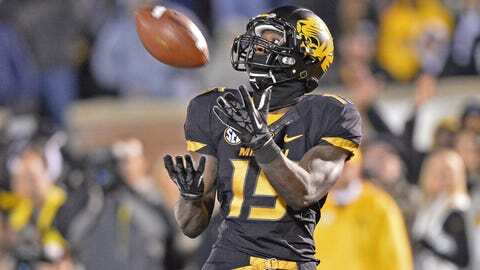 Dorial Green-Beckham reeled in 12 touchdown catches this season for Mizzou. KANSAS CITY, Mo. — There are those who make plays and those who make P-L-A-Y-S, all caps, the kind that get the desk jockeys screaming on your television and make the kids at home want to hop off the sofa and do the same. Dorial Green-Beckham, the Missouri receiver so cool he’s got a user-friendly, marketing-friendly, social-media-friendly acronym, is firmly in the latter camp. Actually, he’s one of its leading lights. When big No. 15 does something spectacular, it’s not just spectacular. It’s a slice of wake-the-neighbors, run-to-Twitter, text-your-buddies utter sickness. It’s not hard to look good playing football against the University of Kentucky; what is hard is looking like the second coming of Megatron in the process. The Tigers’ sophomore sensation from Springfield, Mo., caught four touchdowns in a single game back on November 9 over in Lexington, almost all of them in the all-caps club. Things escalated awfully quickly, too. It wasn’t long before everybody at home figured that, once in the red zone, Mizzou was going to just lob a jump ball into the air and let 6-foot-6 DGB do his DGB thang. We all knew it was coming. Doubtless, the Wildcats’ defensive staff and, indeed, the secondary themselves, knew it was coming, too. And they still couldn’t stop it. That’s a whole other level of helplessness, the ultimate dominance, the ultimate level of good. But is it, say, Heisman Trophy good? For better or worse, the campaign for the 2014 big bronze bad boy starts now, at the Cotton Bowl on January 3, before a prime-time, national television audience (FOX, 7 p.m.). Those 144 yards and two scores in Atlanta during the SEC Championship just whet the audience’s appetite. DGB already has Joe Public on the hook. Now he needs to reel us in. A leg up in the preseason is nice, but you need to finish strong — the voting bloc has remarkably short memories. (DGB racked up seven touchdowns over his last four games, so, check.) You need to put up big numbers against big-time opposition (Big 15 recorded 13 catches against Texas A&M and Auburn but just five grabs, combined, versus Georgia and South Carolina). And your team probably needs to be at least a peripheral player in the College Football Playoff picture, if not one of the lead dogs. As to that last one, given home dates against Central Florida and Georgia and road trips to South Carolina (September 27), Florida (October 18) and Texas A&M, (November 15) the Tigers will certainly get their swings in. It just remains to be seen how many of them actually land. There’s also the little matter of history — which, for wideouts and the Heisman, runs the gamut from bad to miserable. No pure receiver — Charles Woodson, remember, was a two-way freak — has won the award since Desmond Howard in 1991. The former Michigan star-turned-analyst scored a crazy 21 touchdowns receiving (19) or rushing (two) and added two more on returns. The bar probably starts there. Twenty touchdowns, minimum. Beckham’s career high is 12, this season, with one tilt left to go. Although, given his relationship with next fall’s presumed starter, Maty Mauk, it’s hard not to envision a higher ceiling. Of the 10 touchdowns the freshman signal-caller tossed during four starts in relief of James Franklin, five — half of them — went to big No. 15. He’s not just Option 1 in the red zone; he’s Option 1 and 1A. "Right away, we all felt comfortable (with Mauk)," DGB said earlier this year. "I mean, we all felt comfortable when he’s in there. "We go through it at practice. He throws balls to us, so we know what type of ball he’s going to throw. We know where his release is — all that stuff. We study that stuff all day in practice." Based on the statistics kept at www.rotogrinders.com, DGB ranks second among Mizzou receivers this past season in yards per times targeted (or YPT, 9.3 to La’Damian Washington’s 10.4) and times targeted per game (6.2 to Washington’s 7.2). Losing La’Damian is a double-edged sword; the Tigers of 2013 have so many tall, rangy weapons that can jump and catch and block that opposing defenses double one of them at their own risk. In 2014, Green-Beckham won’t be a supporting player anymore; anytime the young fella walks into an SEC stadium, it’s going to be with a big ol’ target strapped across his back. Such is the price of stardom, the burden of great expectations. "Six-foot-6 and runs like heck," Mauk said, admiringly, "(and) can go up and get the football." At least he’ll be getting it in the SEC, college football’s Broadway, under the bright lights, on the biggest stage there is. Like the Big Apple, if you can make it there, kid, you’ll make it anywhere.